With much eagerness to work abroad due to lack of job opportunities and inadequate salary in their homeland, Filipinos resort to availing loans for their placement fees and other job seeking-related expenses. In this regard, many private lending companies and banks offer specific loan service designed for individuals who are going abroad for work. It is called an OFW loan. An OFW loan is a financial assistance agreement catering to Overseas Filipino Workers currently with existing working contract or are about to be deployed to the country where they will be working. It is technically a type of personal, car, business, house or bank loan with special terms and conditions to suit the needs of the OFWs and/or their families. 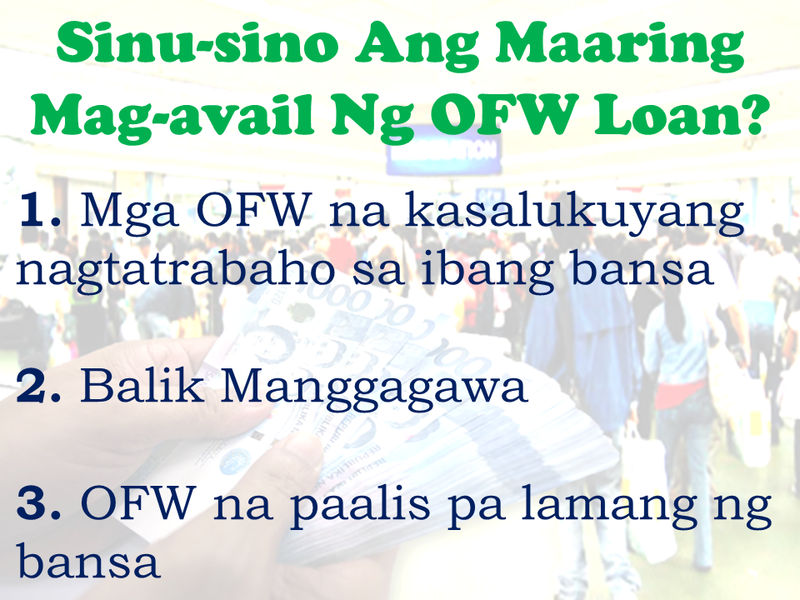 OFWs with the appropriate work documents can apply for loans when needed. 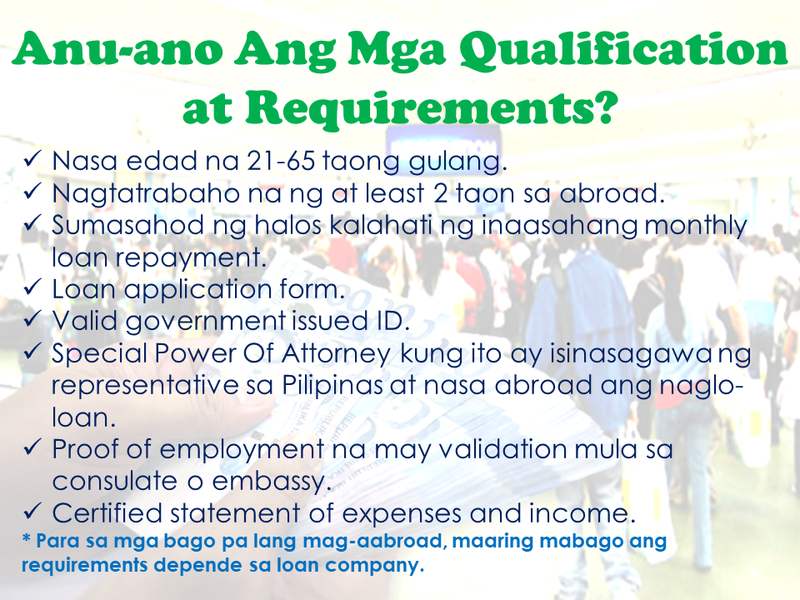 What are the qualifications and requirements needed in applying for OFW Loan? -Must be working abroad fro at least 2 years. *For the newly deployed OFWs, you can directly ask your preferred loan provider for the requirements as it may vary from company to company. -You must submit the completed loan application form (which will be provided by the loan company). -If the loan application is done by the person other than the OFW on his/her behalf, a Special Power Of Attorney (SPA) has to be submitted. -Proof of employment duly certified by the Philippine Embassy or consulate of your host country. It may include but not limited to work contract, payslip etc..
-Certified statement of expenses and income. Why lenders require at least one co-borrower? Having a co-borrower will essentially give lenders a guarantee that they have someone to run after in case you (the principal borrower) miss your payments. It may also increase your leverage of being approved with your loan application. 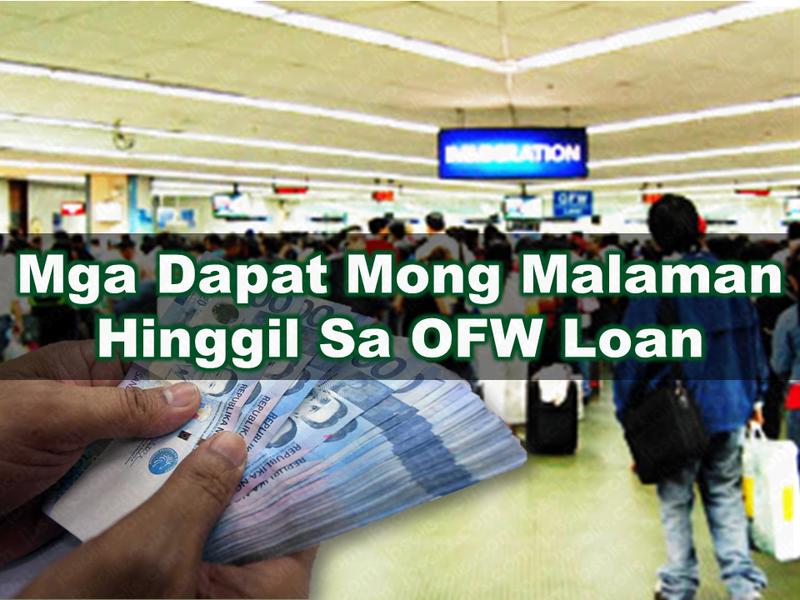 There are banks and private financial company that offer OFW loans. Make sure you are dealing with legitimate ones.